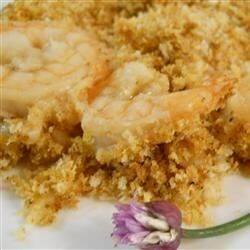 "Great shrimp appetizer that can be prepared ahead of time and refrigerated for later cooking. Terrific with garlic bread or fresh dinner rolls." See how to make crispy-crunchy panko-coated fried shrimp. More shrimp is definitely needed with the amounts listed for the other ingredients. This recipe is great and very easy. It is great with potatoes sliced very thin and baked in the oven. Use the potatoes to soak up the extra garlic and bread crumbs.